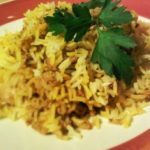 Simple chicken biryani: A biryani is usually made with a different sauce not a tikka sauce. 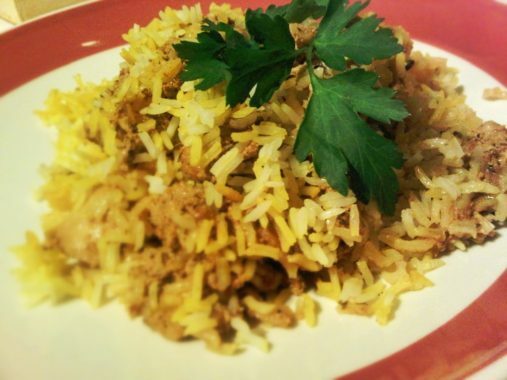 However, we thought you might like to see the basic technique of cooking up a biryani. 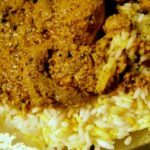 Since we have been mixing up some Waldorf Salad which uses a very basic curry powder, we decided to stay with a curry theme for a few days. In the very near future will set aside some time to write up our recipe for beef biryani as well as some other Indian curry recipes that we have up our sleeves. 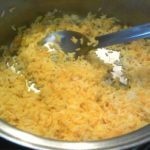 Wash the rice in cold running water then soak for about 30 minutes in cold water. Cook rice with cardamom pods in stock until it comes to a boil but is not cooked through. 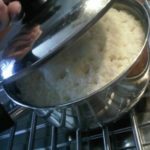 Remove the rice and drain through a fine sieve. Preheat the oven to 185C / 365. Separate the rice into two equal parts, to one part to add the turmeric. You should now have a pile of ‘white’ rice and a pile of ‘yellow’ rice. 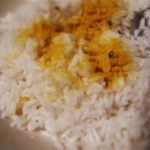 In a deep ovenproof dish, put a layer of ‘white’ rice and dot it with spoons of yellow rice and small knobs of butter. Add a layer of chicken tikka masala. 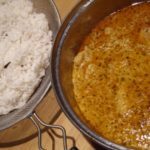 Add another layer of rice, butter and chicken tikka masala, ending with a layer of rice and butter. 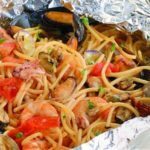 Cover tightly with aluminum foil and place in oven for 35 minutes. 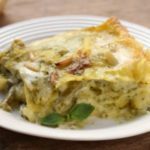 Remove the foil then sprinkle with cilantro before serving.